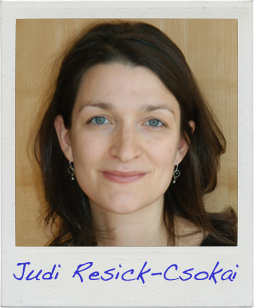 When Judi Resick-Csokai was a rotund, awkward child living upwind of the waning 1980s Pittsburgh steel-mill glory, she secretly wrote vignettes about characters in far-off places like Transylvania, Patagonia and the steppes of Central Asia, and hid them in the ripped seams of her knock-off Cabbage Patch Kid. Writing has always been a compulsion of sorts for Judi, and her passion for the written word translated into a job early on—in middle and high school, she delivered newspapers and even won the coveted Paper Carrier of the Year award twice. Growing up, Judi also spent countless hours studying classical and Eastern European folk dancing and music. From 1994-98, she performed and travelled extensively with the Duquesne University Tamburitzans while completing her undergraduate studies in nursing. She has worked in health care and research in Pittsburgh, Maryland and overseas, all the while continuing to write. Judi has published several essays and completed her first novel, Circle of the Silver Birch Trees, in 2014. She lives with her husband, Attila, and their two children in Pittsburgh, Pennsylvania. Read the first page of Judi’s story!